The Elizabeth table is a sturdy 10-seater oval table with an expanding lattice metalwork design and a diamond interstice border. This 10-seater table includes a classic lazy susan turntable at its centre, which makes passing condiments, dressings and drinks so simple you'll wonder how you ever did without one. Enjoy this classic, but contemporary table while hosting large groups of family and friends on long summer evenings. 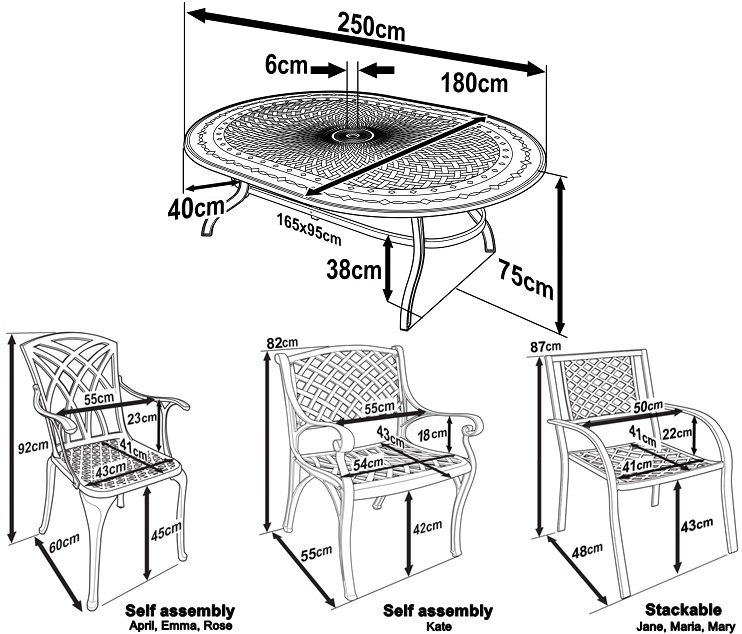 The Elizabeth table also comes with a choice of chairs which means you can customise this piece and make it into your very own set. 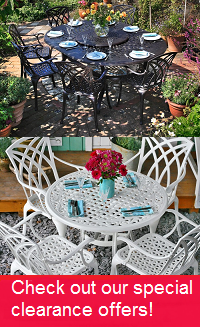 There is high demand for the Elizabeth table & 10 chair set in timeless Antique Bronze, but why not try our alternative colour, the Elizabeth in White, to help brighten things up in your garden. You could even save yourself a few pounds as we often have some great deals on these stunning alternative colours. Don't forget to look at our gifts section above where we offer amazing discounts of 30-70% on a wide range of products to complement your purchase of the Elizabeth table set. The service received and quality of the goods were first rate and will not hesitate to recoomend this outstanding firm to family and friends! You missed it - Unfortunately we no longer sell this product, please check out our best available alternatives: Jennifer 10-seater in Antique Bronze or the Isabelle 12-seater in Antique Bronze. The staff were very nice, competent, helpful and courteous, what makes up for the shortcomings in the delivery, such as damage in transport, and wrong phone number on the consignment, so they couldn't give us any notice. On the plus side, we got a very generous compensation and the faulty parts were exchanged without hesitation. We are going to buy the matching loungers next. All in all, highly recommended. Nothing to say, everything is perfect. The only improvement I would suggest is that delivery should really include enough manpower to lift and move the larger items. Whilst I was quite happy to assist, an older or more frail person may struggle. Very nice sales contact. Permanent monitoring of deliveries. Excellent quality of products delivered. Buying from Lazysusanfurniture was quick and easy. I found each member of staff I spoke to,very helpful and polite. One or two items I was interested in wasn't available and was offered an alternative. My table chairs and Parasol are beautiful. The first choice of parasol wasn't available in my time frame, so I opted for the green, which turned out to be a really pleasent surprise as it's quite a light green and looks fab. I am very happy and would not hesitate in recommending lazysusanfurniture. Brilliant customer service could not ask for a more GREAT COMMUNICATION. The items were exactly what was shown and explained on the website. The assembly process was straight forward, but did need to check some screws. I did have a slight problem with some items, but within two days, I had the additional / replacement parts required. Thank you. The service received and quality of the goods were first rate and will not hesitate to recommend this outstanding firm to family and friends ! Will be placing further orders.